The first plants, related to modern moss and ferns, arrived on land some 450 million years ago and ruled the vegetative world for over 100 million years. These early ferns were seedless and dependent upon water for their sexual reproductive success. The male gametophyte released sperm that were obliged to swim through a watery film to rendezvous with an egg for fertilization, forming a zygote. Seed plants, among the most important organisms on earth, made their first appearance some 350 million years ago and since then have been and continue to be the dominant and most familiar form of vegetation. Seeds and pollen have permitted plants to succeed on land, freeing them from dependence on water for reproduction and enabling them to adapt to drought and the harmful ultraviolet radiation in sunlight. Seedless plants produce only a single kind of spore, which gives rise to a bisexual gametophyte. Over time, some of these plants evolved into seed plants that generate two types of spores: a microspore, giving rise to multiple male gametophytes, and a megaspore that produces a single female gametophyte. The female gametophyte and its surrounding protective coat is an immature seed called an ovule. Pollen grains are male gametophytes containing sperm enclosed in a protective coat, which prevents sperm from drying out, helps them withstand mechanical damage, and enables them to travel long distances and spread their genes. Unlike sperm in seedless plants that must travel to the ovule, seed plant sperm are passively carried in air currents. Transfer of the pollen grain to the ovule-containing part of the plant is called pollination. After the egg cell, inside an ovule, is fertilized by sperm, the ovule produces an embryo that develops into a seed. Seeds provide the embryo with protection and nourishment, and enable the embryo to remain in a dormant stage for decades, if need be, awaiting favorable climatic conditions for germination. Seed plants (spermatophytes) are of two major types: gymnosperms (“naked” seeds), including the conifers, and angiosperms (flowering plants), of which there are some 250,000 species—about 90 percent of the plant world. SEE ALSO: Land Plants (c. 450 Million BCE), Gymnosperms (c. 300 Million BCE), Angiosperms (c. 125 Million BCE), Depletion of the Ozone Layer (1987). Seed plants permit pollen grains to carry male sperm long distances, under adverse climatic conditions, to fertilize ovules. 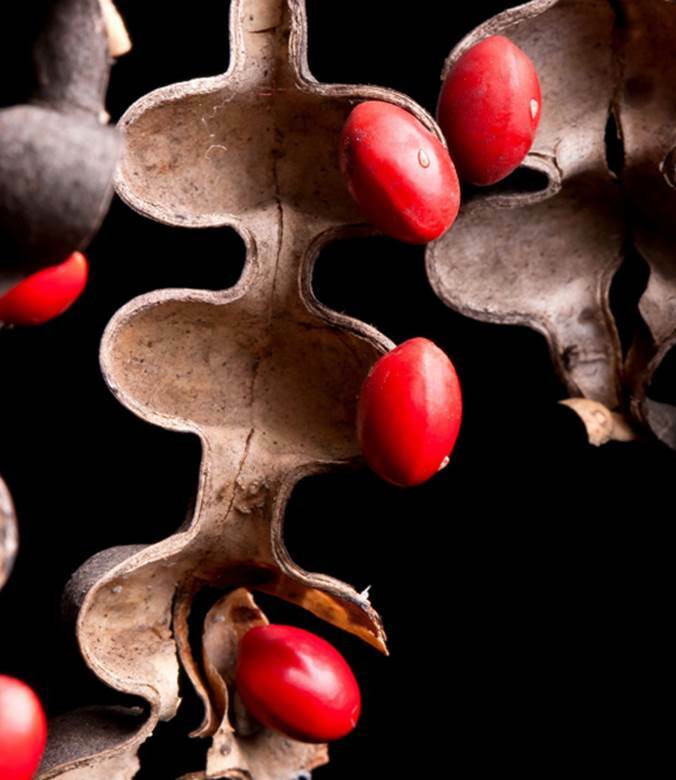 These seeds are from “lucky bean” trees (Erythrina lysistemon), members of the pea family that are cultivated in parks and gardens and believed to have magical and medicinal properties.